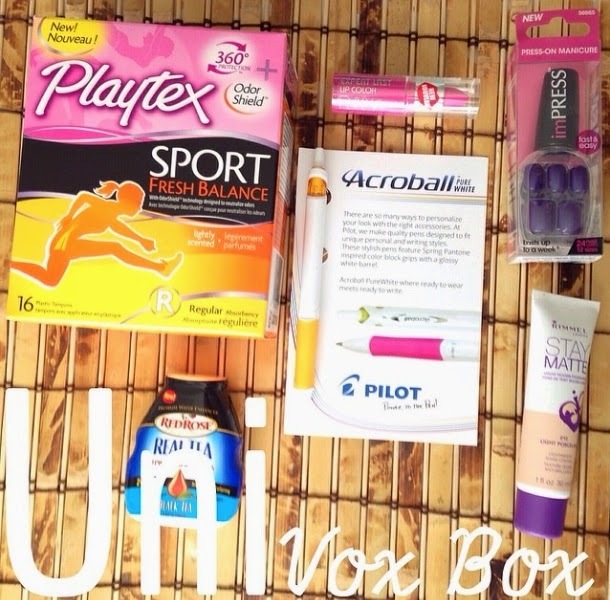 I received the UniVoxBox from Influenster a few weeks ago, with it being pretty crazy around here I'm just now getting around to writing up my review on everything in the box! I haven't worn press-on nails since middle school! I really wanted french tip acrylics but my mom insisted on trying press-on nails first. And let me tell you, I was a bad-a** with those press-ons! ;) Since high school I've really been keen on the gel nails trend, so when I tried this press-on manicure I felt weird! They stayed on pretty well, but they just aren't my style anymore. I think they'd be great for a younger audience! Wow, this stuff is BRIGHT. I love obnoxious lip colors and this fit the bill. What's also nice is that it smelled good, totally random...but definitely a perk! I would suggest whitening your teeth like crazy so the lip color doesn't make your teeth look yellowish, and to also exfoliate your lips and moisturize before applying! I love a nice and smooth pen, and this is a great brand to add to my collection! It has the nice finger grip so if you're writing a lot, it won't make your fingers sore. I'll be honest here, my face is insanely dry since moving to Utah so I've shied away from any kind of heavy foundation. While this liquid mousse is easy to apply and feels light on my skin, it didn't look so good on me except in pictures. I was sent too light of a color, and the foundation was sinking into all the creases in my skin as well as emphasizing the dry flakes. Not very pretty! However, I think this would work better with someone who has oily skin, because this foundation will help counteract that. What's funny is I've actually used this brand since high school! It's my go-to because I've always been physically active and I like the security I feel with this feminine brand. I love influenster! I got the Mary Kay box and can't wait to write up my post!